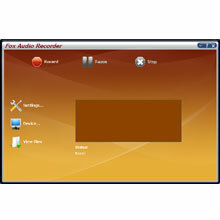 Fox Audio Recorder helps you to transfer tapes, LPs, live performances, Internet radio, TV, DVD player, or any other sound source to your hard drive with no loss of quality. Various effective recording settings make your recording task interesting and attractive. The software helps to protect your valuable recordings--just set the sound source, the recording quality, and volume, then start recording. With it you can record sound from internet broadcast, live performances, tapes, LPs, TV, DVD player, CD player, microphone, real player without loss of quality. he new recordings are saved to the hard drive as a WAV,MP3 or WMA format without costing any other disk space. Qweas is providing links to Fox Audio Recorder 7.4.0.10 as a courtesy, and makes no representations regarding Fox Audio Recorder or any other applications or any information related thereto. Any questions, complaints or claims regarding this application Fox Audio Recorder 7.4.0.10 must be directed to the appropriate software vendor. You may click the publisher link of Fox Audio Recorder on the top of this page to get more details about the vendor.